Just about anyone who has anything to do with the macadamia industry knows or has heard of Ian McConachie, who has for almost half a century been a key player in helping to establish and grow the macadamia industry in Australia. 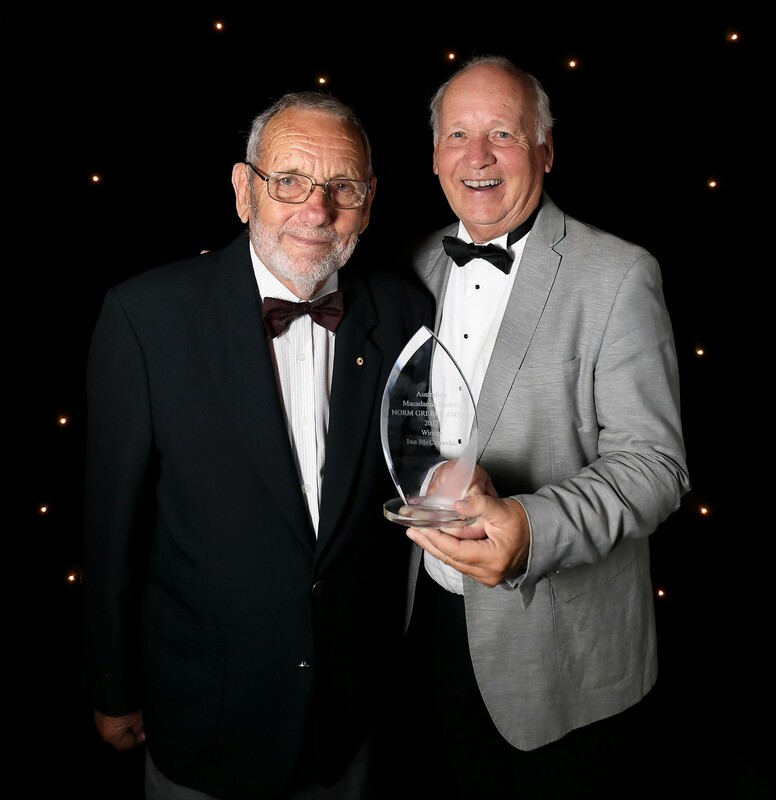 Ian’s enormous contribution was recognised at the Australian Macadamia Conference in November last year, when he received the industry’s most prestigious award – the Norm Greber Award. Of course, this is not the first award that Ian has received for his commitment, rather it joins a list of honours, including being awarded the 1994 Golden Nut award from the International Nut Council, a Member of the Order of Australia (AM) for services to the industry in 2006 and becoming Honorary Senior Fellow of the University of the Sunshine Coast in 2014. In presenting Ian with his award, AMS president Richard Doggett acknowledged Ian’s many achievements, which include 45 years membership of the society. In his early years in the industry, Ian helped establish orchards as well as being involved in setting up Suncoast Gold in 1974. But it is perhaps his work in researching macadamias varieties and ensuring conservation of wild macadamias that will in the future be viewed as his most significant contribution. “Years ago, Ian selected a promising variety MCT1 from a range of material he accessed from the Queensland Department. After patient evaluation since, Ian and his wife Jan have now gifted the variety to the Macadamia Conservation Trust and over the last year he has worked tirelessly to release the variety to industry, with all profits going to the Trust,” said Richard Doggett when he announced Ian as the winner of the award. There are great hopes in the industry for MCT1, for which sales have already been strong. This should provide a long-term income base for the Macadamia Conservation Trust. And it is not an exaggeration to say that without Ian’s hard work the trust would be much less an organisation than it is now. He was responsible for maintaining the trust status as a Registered Environmental Organisation and a Deductible Gift Recipient thus allowing all donations to be tax deductible. Ian and the Trust were recognised at the recent International Macadamia Symposium in China with awards for his personal contribution and for the work of the Conservation Trust. These awards also reflected well on the Australian industry and our global leadership. “Ian also continues to be relentless in his advocacy of the importance of quality in the Australian industry and many of you will have received one of his sermons on this important topic,” said Richard. It was very fitting that Richard concluded his presentation speech by acknowledging that it there was no better recipient than Ian, who is “cast in the same mould as the award’s founder and has probably contributed equally as much to the Australian industry”. Congratulations Ian, from all in the industry. Ian McConachie (left) receives the prestigious Norm Greber Award, presented by AMS Chair Richard Doggett.